Ah, it’s good to be back! I haven’t posted for two weeks. My seedlings are growing very nicely. I had to transfer my okra and sugar snap peas into larger pots. They are growing by leaps and bounds. 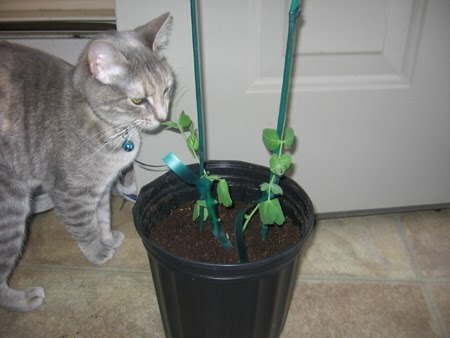 I placed the sugar snap peas in one gallon pots and gently tied them to two foot stakes to give them a little support. As you can see, my cat gave me her personal approval…AFTER checking my work. I also placed my okra into larger flower pots. I think they are going to do very well. They look very strong. They were a bit leggy, but I just buried the stems, so I think they will be alright. Since okra plants are heat lovers, I have to keep these beauties thriving indoors until mid-May or June 1st. Speaking of thriving, there are plans in the works to get the garden cage repaired this weekend! I will be sure to post lots of pictures of the rebuild. I am relieved that we are finally getting this done as my cold crops need to get in the ground and grow nice and big for the market! Ok, back to the plants. I have been saving all of my eggshells. Eggshells are a great source of calcium for tomato plants. You don’t have to do anything special with them, just let them dry out on a paper towel. I usually throw them in the hole with the tomato plants at transplanting time. However, this time, I crushed some of them up very finely and sprinkled them on the soil around my tomato plants. Here’s a little growing tip for your plants. 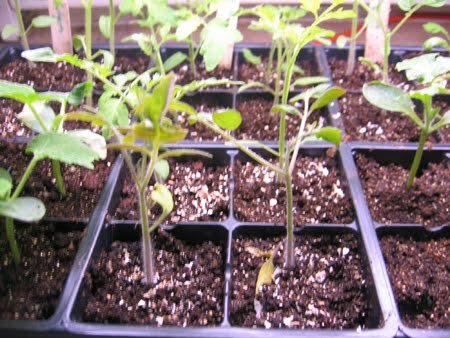 You may be tempted to plant tomato, pepper or cucumber plants outdoors now since all of the garden centers are selling them. In a word: DON’T. Tomatoes, peppers, cucumbers, watermelons, eggplants, cantaloupes and others are heat loving plants. Although the days are starting to warm up, nighttime temperatures are still in the low 30s and 40s and can kill your plants quickly. The only plants that can go out in the garden now are cold loving plants like lettuces, radishes, spinach, kale, collards, and mustard greens. That’s all for now folks! Until next time….happy garden thoughts! Thanks for that reminder not to succumb to temptation and put those heat lovers outside. 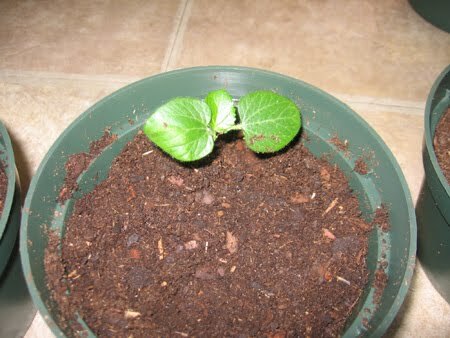 My cuke seedlings are getting big and anxious but I don't want any visits from the plant police so am holding on. I was so eager to harden off my plants, I set them outside before work on one of those chilly mornings last week. Even at 7:30AM it was still so frosty I lost all the leaves off the tallest ones. Next time, they'll just have to stay indoors. Better to waste a sunny day than lose the leaves to frost. I'm so sorry you lost your plants. When I go to harden off, I usually set them out later in the morning and in a shady spot protected from the sun and elements.